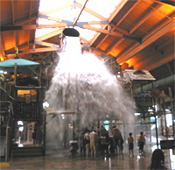 Virginia finally got a taste of indoor waterparks when Great Wolf opened its sixth resort just outside of the colonial charm of Williamsburg. Features at this Great Wolf resort include the Crooked Creek lazy river, the River Canyon Run family raft ride and many other body slides and kiddie play areas. The park is reserved for guests staying at the hotel.